we are vehicles of dreams. "Silver Pearl", "Counterpoint" and "Weep no more". These three short poems by John Horn, are letterpress printed in Perpetua on an ADANA "eight-five" handpress. Second edition of 28 copies signed and numbered. Endpapers are blue Khadi. 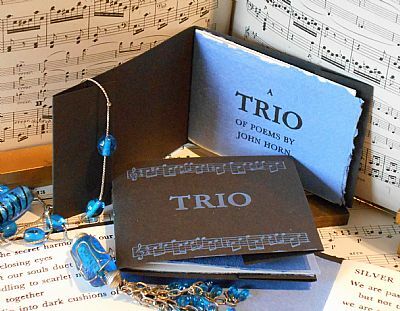 The poems are sewn into Black card with titling in blue. 105mm x 83mm.10 pages.